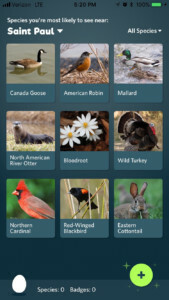 The app opens up to give you an idea of what species are near you. It’s no secret that I’m a fan of technology, especially if I can use it to teach kids about the outdoors. And more apps are emerging to make it easier than ever. Birders have been ahead of the game when it comes to creating apps for identification and finding birds on smart phones. One of the coolest is the free app Merlin by Cornell Lab of Ornithology that will identify your bird photos with incredible accuracy. Even if you don’t have a photo, it will ask you several questions and still give you identification, all while teaching you things to watch for like behavior and location. There’s also the BirdsEye app that will tell you what birds are being reported to eBird, complete with driving directions to help you find them. It’s so powerful that some sensitive species’ exact locations are being obscured by eBird to prevent poaching, especially birds popular in the pet bird trade. There are also apps that let you file your sightings to eBird directly from the field. While all of this has been developed, a site called iNaturalist.com has become a community where you can report nature sightings of all kinds: birds, trees, mammals, insects, fungus, fish and even lichen. 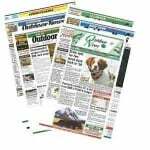 This community of naturalists aids with ID to help vet the sighting. People can create projects asking others to look for types lichen or bumbles, and many parks use it as a repository for their entire sighting during a bioblitz. iNaturalist, too, developed an app that allows you to report from the field – it was just OK. Then, in the past two years, the app upped its game. Now you can take photos of what you can’t identify, and it does a good job of identifying your photos. If the app cannot do it, post it publicly to your profile and their network of naturalists will help with tougher identification. This is exciting technology, and I use it with kids as they help find what kind of wildlife we have in our park on our trips. But now there’s an even newer app that is more of a game, and you don’t need an iNaturalist account to play. It’s called Seek, and the app can pinpoint your location and give you a list of wildlife that can be expected in the area. Then it encourages you to take photos and create a collection. Like Pokémon Go, as you “collect” nature you see, you can work towards earning badges for different milestones – like the Cub Badge, which means you’ve submitted on 15 different species. The app works with your phone and you’re meant to take photos – not necessarily the way I do with my spotting scope. And that’s OK because it’s making you aware of the common, cool nature that exists right in your backyard or local park. I tested it with several different species and was surprised that it could identify a Cooper’s hawk and even a spiny softshell turtle chewing on a fish. I was even more surprised it could identify European species and harder-to-find birds in the United States like the great kiskadee. It did an OK job with insects, but was not as accurate as it was with plants, birds, and mammals. It even does a decent job with blurry photos. The easy-to-use app is free to download. Take a kid along and see how many species they can catch. If you go fishing, don’t forget to take a picture of the fish to add to the collection. When you open it to see what’s near you, it will include nifty factoids about that critter to help you find it or to be alert for interesting behaviors. Who knows, maybe you’ll find a rare plant or previously unreported type of bee in your area.